Cape Town, 13 March 2018: Human-wildlife conflict is the main challenge facing Cape leopard survival. Farmers fear leopards because of the risk to their livestock and personal safety. To raise awareness of leopard conservation, two charity beneficiaries of the ABSA Cape Epic will partner over the next few weeks to help dispel this myth. Children from the Anna Foundation will be hosted by the Cape Leopard Trust to explore wild areas on foot and on bikes to seek spoor, tracks or signs of other wildlife. According to CEO of the Cape Leopard Trust, Helen Turnbull: “These leopards are extremely elusive and live in rugged, inaccessible terrain, so it’s difficult to be absolutely accurate about the number of wild leopards that still roam free across Absa Cape Epic territory. The organisation uses field cameras to investigate leopard presence, and a camera survey currently underway in the Cederberg indicates in preliminary findings that 47 individuals have been identified in that particular area,” she said. Turnbull expanded how the organization is committed to using environmental education to inform communities about the role the leopard plays in maintaining eco-system health as apex predator. “Our educators use the natural environment to share knowledge around issues that affect leopard survival.” she added. A group of children from the Anna Foundation enjoyed a conservation education session near Paarl this week. “This eco activity forms part of our 3R’s programme, reading, running and the third R – right-ing which focuses on life skills and environmental appreciation. The children from Buffet Olives who participated are becoming extremely skilled on mountain bikes, thanks to our Sports Development programme and a group of them were able to enjoy the Paarl veld from the saddle of their bikes,” said Anna Brom, Founder and Director of the Stellenbosch-based NGO. Brom elaborated that the ‘running’ in their tagline referred to all sports coaching and development the children in the programme enjoy. “There was much excitement yesterday when the children learnt that one of the leopards, they were introduced to during the Cape Leopard Trust presentation, named Maximus, lives in the mountain very close to the Buffet Olives property,” she added. “As a beneficiary of the ABSA Cape Epic, the practical involvement with these events, and the benefit the children experience from engaging with the various activities related to the race, adds to the sustainability and educationally sound post-school programme we offer,” she added. “The United Nations World Wildlife Day 2018, celebrated on March 3rd, dedicated this year to Big Cats. This global message reinforces that we all need to pull together to help protect the Cape’s remaining leopards,” added Turnbull. 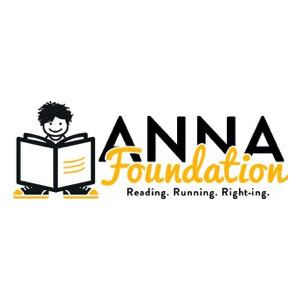 Anna Foundation is an organization committed to providing reading, riding and right-ing to rural farming communities in the Western Cape. Focused on the long-term impact on children’s life, the organization offers well-designed holistic after-school programmes including education, sport and life skills.